There is nothing quite like the beauty of a rose garden in bloom. But if this year is your first attempt, begin on a small scale. Learn what care a couple rose bushes demand before you plant a dozen or more. The most popular of the hybrids, these roses produce large double flowers borne singly or in small clusters on long stems. They come in a variety of colors and fragrances. Excellent for cutting. These roses are generally lower growing than Teas and the flowers are smaller and borne in large clusters. 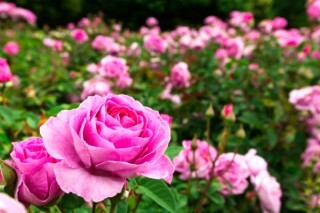 They are an excellent rose to use for mass plantings in your landscape. This type of rose was created by interbreeding the Hybrid Teas and the Floribundas. The result is a vigorous plant that produces flowers muck like Hybrid Teas but in larger clusters. Roses that can be trained to grow on a fence or trellis. Most will bloom continuously through the summer. They produce single flowers or cluster flowers. Hardiness varies depending on the type. These are scaled down versions of Floribundas that grow usually no more than 18″ High. They are ever-blooming and require the same care as your Hybrids. This type of rose has become very popular for landscape planting. Either for a single bush, or a mass planting. They are very hardy with little to no winter protection needed. Maintenance itself for these roses is minimal. Most are ever-blooming and range from very low growing to 5″ tall. Old-fashioned roses have very large double flowers and are very fragrant. They come in beautiful shades of pink as well as white and yellow. They grow about 5″ in maturity. Where you place your rose bush in your landscape is very important. It should receive at least 6 hours of sunlight. Spacing of each plant should be 2′ to 3′ apart from one another (smaller varieties may be placed slightly closer). It is essential this spacing occur for good air circulation. It has been tested at Boerner Botanical Gardens that it is best in Southeast Wisconsin to plant rose bushes so that the bud union is about 2″ below the soil level. Roses prefer good drainage, so a good rich loose soil with some bone meal mixed in (about 1/2 a cup per bush) is best. If a mounded bed is possible, it is recommended. A light mulching of cocoa hulls is effective after planting. It’s important to replace the nutrients your roses take from the soil through the growing season. As soon as your roses are fully leafed out, apply a balanced fertilizer, such as Miracle Gro, inside the drip line, in a circle 6 inches from the base. Always apply fertilizers according to the instructions on the product label. Containers After the new growth is off to a good start, fertilize with a liquid plant food. Use half the recommended amount until the plant is growing well, then increase to the full recommended amount and use according to label directions. 4. For proper hardening of plants for winter, do not fertilize late in the fall. Roses need good drainage -roots should never sit in water. The best way to water is the drip method. Soak the bed slowly and thoroughly to a depth of 10-12″ with a small flow of water. Deep water encourages deep rooting and increased drought tolerance. Watering roses deeply every three to five days is preferable to shallow daily watering. Sprinklers are fine as long as the bed receives enough water to moisten the top 6″ of soil. If you water from above, do so in the early morning so the foliage has time to dry. This will discourage disease. To see if your roses need watering, scrape the surface of the bed. If you don’t feel any moisture an inch below the surface, it’s time to water. Be sure there are drainage holes in your container. During the season, watering two to three times a week should be enough. However, if you feel no moisture an inch below the soil surface, it’s time to water.